Walking into Anthropologie instantly transports me to a happy place. The carefully curated window displays. The gorgeously styled mannequins. The one-of-a-kind flowy dresses, vintage-inspired jewelry and adorable tschotskes. It even smells good when you step inside an Anthropologie store. But nothing at Anthro — even that lovely dreamlike scent — comes cheap. (Those candles they’ve forever burning in the stores are $28 a pop.) That’s the one not-so-great thing about Anthropologie. One look at the price tags, and I’m instantly jolted from my happy place into reality. As much as I love the Anthropologie look and style, I refuse to pay full price for their items. So what’s an Anthro-loving girl to do? Over the years I’ve gathered a handful of pro tips from my own shopping experiences as well as from friends who’ve worked there. Here are my top nine ways to save money at Anthropologie so I can kiss those preposterously steep price tags goodbye. Joining Anthropologie’s loyalty club, ANTHRO, is free. You’ll get a few snazzy perks like access to a personal stylist, a chance to shop new arrivals before everyone else and invites to exclusive in-store events. But the best perk is a discount code on your birthday every year. If you sign up at least 30 days before your birthday, you’ll get a 15%-off coupon via email. For more details, check out this in-depth FAQ about the birthday discount from fan blog Endless Anthropologie. When you join, you’ll also be added to the email list. Brace yourself for Anthropologie inbox overload. They send tons of emails, including sales and promotions. 20% discount at the Terrain café for employees and one guest. Excludes alcoholic beverages and the purchase of gift certificates. The discounts don’t apply to sale items, with one exception: Three times a year, Anthropologie hosts employee appreciation events at every store in the network. Employees get to buy not only regularly priced items, but also redlined sale-priced merchandise at 40% off at all Anthropologie, Free People, Terrain, BHLDN and Urban Outfitters locations and websites. Don’t want to get a job at Anthro? You can still get a huge discount if you work an inventory shift. While taking inventory on every single item in the store can be dull, it’s not a bad way to make a few extra bucks for a few hours of work. Plus, you’ll get to purchase one item for 40% off. It’s no problem if you’ve never worked for Anthropologie. Each store usually brings in extra temporary help for inventory, so give yours a call to get details. Sometimes you just gotta have that dress, even if it’s full price. But save your receipt. Anthropologie offers price adjustments within 14 days. So if an item you’ve purchased goes on sale, you can bring in your receipt to get back the difference. Even if the item was already on sale when you bought it, keep that receipt. Anthropologie may continue to discount it, and you’ll still be eligible to receive price adjustments on those additional price cuts. While sticking to the sale section is the oldest trick in the book, the Anthropologie sale section is extra special. Always tucked away in a room in the back, it’s often chock-full of gems. Here’s why: Many Anthropologie items can only be purchased online. But all items can be returned in-store. Oftentimes, those online returns go straight to the sale room so the store won’t have to ship them back to the warehouse. I’ve found deeply discounted $300 shoes, $170 jeans and all sorts of other goodies in the sale room that came from online returns. The sale room is also a great place to score items that have been discounted because of imperfections such as a missing button or small snag. Someone else’s gift card trash is another’s treasure. You can buy discounted gift cards on several legitimate sites to bring down the price of your Anthro purchase. I found gift cards for 18% off on Raise, 3% off on Gift Card Zen and 3-5% off on Gift Card Granny. Don’t forget to check Craigslist, too. I found someone selling a $325 gift card for $175 — though I admit that seems almost too good to be true and I’d take a few measures to ensure the gift card was valid before handing over the cash. You’ll need to create an Anthropologie account to save items to your wish list. If any of the items go on sale, Anthropologie will email you. It’s even worth including sold-out items, because sometimes they pop back into stock. I recently bought a brand new, tags-still-on Anthropologie dress on Ebay for $80. It was originally $300. Yet since eBay sellers know Anthropologie items are so sought after, they’re not always honest. Search “Anthropologie” on eBay, and you could get ripped off; sellers may simply include the store name in the listing title so the item shows up in search. The real way to tell is by brand name. Search by the brands that Anthropologie sells, such as Sweet Pea, Language, Velvet and Weston Wear. As Anthropologie and Urban Outfitters are owned by the same company, there’s sometimes confusion about which brands are sold where. The following brands are NOT sold at Anthropologie: Free People, Lux, Kimchi and Blue, Angie, Matty M, Truly Madly Deeply and ICE, according to self-proclaimed Anthropologie obsessed eBayer eelbay9. Anthropologie has such a committed group of customers that a couple of blogs are entirely dedicated to the store. Follow them to stay in the loop about discounts and promotions. Effortless Anthropologie: One of the most popular Anthro fan blogs also has a Facebook group 5,000 strong where you can sell, swap or buy Anthropologie and BHLDN items. Blogger Thea Domber even sometimes teams up with Anthro to run contests, Racked reported last year. Breakfast at Anthropologie: Sophie frequently posts about sales, plus curates the “best of sale” posts when items get discounted. The bohemian chic Anthro style can be costly. Buzzfeed recently published a list of ridiculous things you can buy at Anthropologie, which was so funny because it rang so true. It included a $3,000 armoire. But if you shop like a pro, you’ll never have to pay full price at Anthropologie ever again. Unless you reaaaaally must have that just-your-style piece. And in that case, keep your receipt! 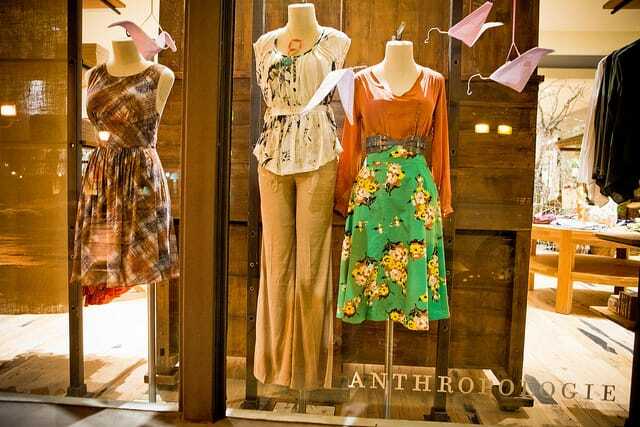 Your Turn: Do you have additional tips for saving at Anthropologie?